Artist’s impression of the Galileo spacecraft flying through a plume from Europa. Credit: NASA. This month has seen missions large and small launch towards Mars, and new results from the Gaia satellite. What gets astronomers so excited about such datasets? Meanwhile, astronomers have been using machine learning to address a number of problems – we discuss a couple of examples which have been published recently, one about exoplanets and another about asteroids. 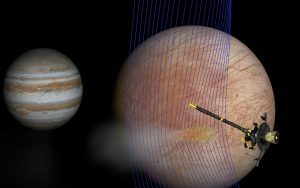 Finally, there have been exciting new signs of plumes from Europa, one of Jupiter’s moons – something that future missions might be able to explore in more detail. An extended edition of an original broadcast on 31st May 2018 as part of Pythagoras’ Trousers on Radio Cardiff.